Even though we had grown up together, being 10 years older than I, we weren’t really close for much of our childhood. It wasn’t until his marriage took a crash dive and he moved back to the house that he decided it was time to take me under his wing and show me the ways of the world. Looking back, I think he did this in large part because my father had taken ill. My mother’s time was consumed with taking care of my father. We were extremely poor, but I didn’t really know that at the time. My mother always made sure I had everything I needed, even though she couldn’t always give me everything I wanted. I think the first time he took me with him when was he was plotting out a car rally for his local car club. The idea of a rally is to write hard to decipher clues that the drivers had to follow. Such as Giant shell, 11 minutes, turn right at 32. Unlike most races, speed was not the goal here, accuracy was. If you didn’t go exactly 32 mph you wouldn’t hit the turn in 11 minutes and would be lost. We spent the entire day plotting out the course. From then on out he would regularly take me on his adventures, or should I say, misadventures. By now he had taken up skydiving, but he still found lots of time to get into all sorts of mischief. He would regularly call my mom at 3 a.m. to ask if she’d seen his “blue suede shoes walk by” as he had lost them or to bring him a toothbrush out in the middle of nowhere. We spent almost an entire day out in the sticks once looking for his MG, which had mysteriously driven itself off a country road in the middle of nowhere. We’d drive 20 or so miles one way, then back down another road as he’d say, “Nope, this is isn’t it, bummers, bummers.” Just as all looked hopeless, he slammed on the brakes of the car. “Looks familiar.” We got out, walked along the gravel shoulder and sure enough, there were two tire tracks leading off the road, over an embankment and into some trees. He missed the pond by about 20 feet. 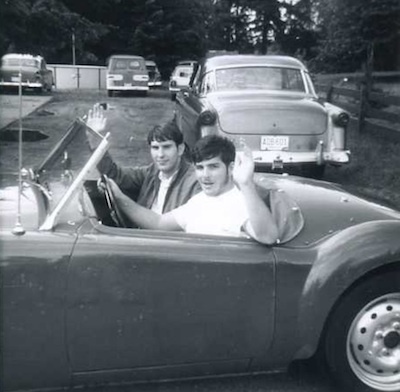 Jon at the wheel of his beloved MGA. I really liked the MG. It fit him perfectly. One time he picked me up in the car and the windshield was missing. He just wanted to see what it was like driving open and free. I remember putting on the Italian racing goggles and hopping into the passenger seat. We shot down I-405 at 90 miles per hour, my mouth filling with air (and bugs). I now appreciate windshields much more than I did in my youth. Handy little things. I saw my first Errol Flynn movie with Jon. It was at the Grand Illusion in the University District, which had only been open a couple years back then. As we watched Robin Hood on the big screen, I’m not sure who was the biggest star in the room, Errol or my brother. Both were bigger than life. Thanks to him, I got to see Johnny Cash, Three Dog Night and Creedence Clearwater in concert. Not the old washed up Three Dog or Creedence of later years, but the originals. We’d sit in the Coliseum and he’d light up a big cigar. Everyone else was lighting up some funny smelling stuff, too, but I was too naive to know what it was back then. When the weather allowed us to go skydiving, I was with him nearly every weekend. I would pack his chutes. I even set him up so his girlfriend of the time, Annie, could make one of his dreams come true – to get a pie in the face. When one of my GI Joes was blown off course and landed in a tree, Jon was undeterred. He put on his blue stocking cap, grabbed a saw and headed over to the tree. He made quick work of the tree, which happened to belong to Lake Sammamish State Park. I got Joe back. For Jon, it was always a short life and a merry one. Looking back, I suppose I should have seen the signs that his days were numbered. He was packing an awful lot of adventure into a very small window of time. 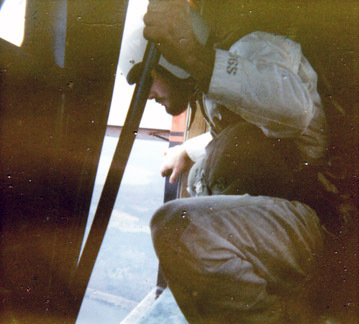 Jon in the door of the jump plane, waiting for the signal to go. He even delivered on all the promises he had ever made me in the last month of his life. He had alway promised to take me up in the jump plane with him to watch from above. He did. He promised to take me to Snohomish Parachute Center. He did. He even showed up to a family party with his new girlfriend, something he never did, ever. And when the knock on the door came on that Labor Day, I instinctively knew what had happened. I didn’t even need to be told. I heard my mother crying and walked into the kitchen to see Jon’s two friends from the parachute center. My father was bawling. It was the only time I had seen him cry. Me? I walked out on the front porch and hugged my dog Barney as hard as I could and burst into tears. I had lost much more than my brother. I had lost my mentor. But his lessons live on. I have lived life to its fullest, knowing that we never know when the curtain comes down on our last performance. We are here by the whim of the powers that be and we have to make the best of what is thrown at us, good and bad. The only thing we can do in the end is to laugh at our follies and enjoy every moment we have here. So I do. I think my brother is up there smiling, too, proud that I have learned one of the most valuable lessons possible – to live life without apology and without regret. Thank you Jon for being my brother.